There is nothing more satisfying as savoring the contents of a jar that contains your own specially prepared, home-canned goodness. Turn the simplest meals into exciting restaurant-grade presentations with Putting Up More: A Guide to Canning Jams, Relishes, Chutneys, Pickles, Sauces, and Salsas by Stephen Palmer Dowdney. 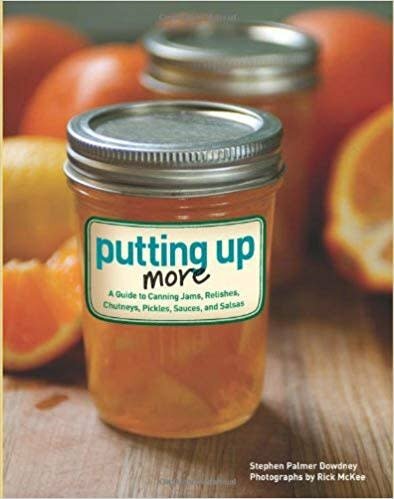 This sequel to his first book, Putting Up, provides additional recipes as well as excellent advice on how to safely can jams, relishes, chutneys, pickles, sauces, and salsas. Also included are the author's personal notes, thoughts, and experiences on each easy-to-follow recipe. The exceptional recipes help you utilize the produce you have preserved and stored in the pantry with its plentiful breakfast, lunch, dinner, and snack suggestions. From fruit marmalade to prickly pear cactus jelly, there is sure to be something for even the pickiest palate. With over 60 recipes using common fruits and vegetables, Putting Up More is a great canning book fit for anyone wanting to preserve the bounty of the season!